The American Institute for Medical and Biological Engineering (AIMBE) has announced the induction of Yihong Yang, Ph.D., Senior Investigator and Chief of the Magnetic Resonance Imaging and Spectroscopy Section, National Institute on Drug Abuse, National Institutes of Health to its College of Fellows. Dr. Yang was nominated, reviewed, and elected by peers and members of the College of Fellows for outstanding contributions to the development and application of functional magnetic resonance imaging to psychiatric disorders. 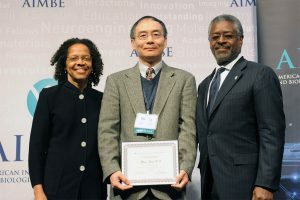 A formal induction ceremony was held during the AIMBE Annual Meeting at the National Academy of Sciences in Washington, DC on April 9, 2018. Dr. Yang was inducted along with 156 colleagues who make up the AIMBE College of Fellows Class of 2018.